2019 is off to a rollicking start for the S&P 500 (Index: SPX), which appears to have launched into its first Lévy flight event in 2019. If that's not a term you're readily familiar with, here's what that means. A Lévy flight is similar to a random walk for stock prices, but instead of the relatively small changes in stock prices that characterize a true random walk, it is characterized by the sudden emergence of comparatively large changes - more so than would be predicted by a normal distribution. From our perspective, Lévy flight events can occur whenever investors shift how far forward in time they are looking into the future as they go about setting current day stock prices, where the differences in expectations for the sustainable portion of future earnings associated with these different points of time drive these outsized changes in stock prices. For the first Lévy flight event of 2019, that shift appears to be from the distant future quarter of 2019-Q4 back to the current quarter of 2019-Q1. It was even sort of predictable, where we described what would happen if investors acted to shift their forward-looking attention just as they appear to have, well before the market even opened last week. 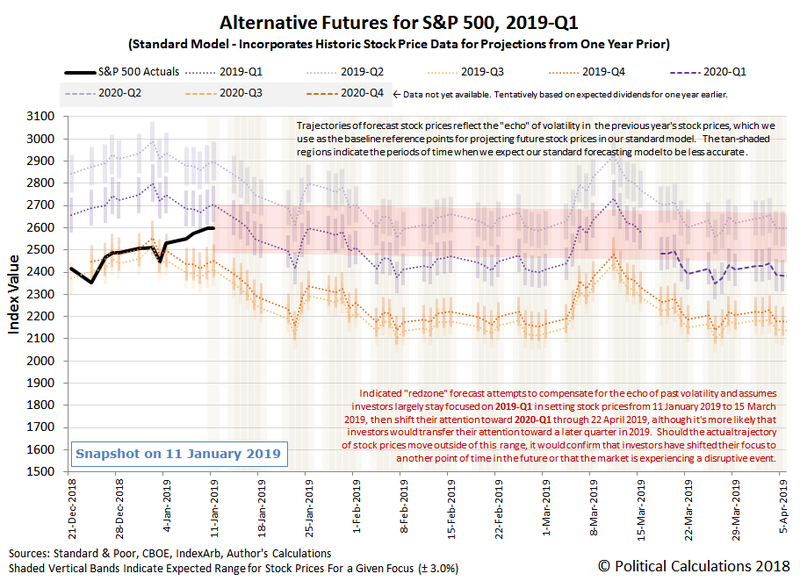 If investors remain focused on the distant future quarters of 2019-Q3/2019-Q4, the S&P 500 can be expected to generally follow a downward trajectory throughout 2019-Q1, falling into a true bear market for the index. If investors shift their attention toward 2019-Q1, the effect would be to boost stock prices higher, where they would largely move sideways during the quarter with respect to their current level. Should investors shift their forward-looking focus to 2019-Q2, the market would see a significant rally above its current level. Investors chose Door #2 in this real-life Monty Hall problem! Meanwhile, because we've now entered the period of time where it will be relevant, we've redrawn our redzone forecast to correspond with this selection, anchoring its starting point with where the S&P 500 closed on Friday, 11 January 2019. If you want to know more about our assumptions in generating the forecast, we've incorporated them in the annotations on the chart.